These stunning sun-loving flowering shrubs, growing at the The Little Sisters of the Poor St. Francis Xavier Home for the Elderly in Cheras K.L., certainly caught our eyes. Golden Pseuderanthemum simply adores the sun. From afar, we saw smiling and sunny faces, reverberating in the sunlight that was showering them. 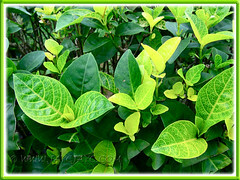 The variegated leaves shone vibrantly in varying shades of yellow, chartreuse and green. On closer inspection, we realized that the matured bushes must have been given a hard prune recently, and were putting on a growth flush with a wonderful exhibit of new leaves in golden yellow, differently coloured from the older yellowish-green foliage. What a lovely sight! Also, a closer look on one of the sparsely scattered flowering spikes jolted my memory back in time as I recalled its familiarity! Yes, it’s none other than Pseuderanthemum reticulatum, the same plant that I helped identify for Nicola of Garden in a pot. Got its botanical name from Dr Francis Ng’s book titled Tropical Horticulture and Gardening. What an amazing coincidence! Yellow-vein Eranthemum looked even more attractive live when basked in the bright sunshine. 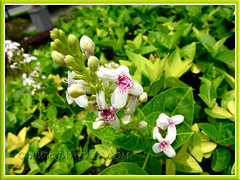 And, there and then, we decided to get these flowering shrubs to grace our frontyard garden! They’d make great screen or hedges along our chain-link fence where there’s ample sunlight to cheer them. We returned to the Home in early May and managed to obtain some cuttings. Almost all the cuttings rooted successfully as seen in the left image and we were really surprised that the one propagated from tip cutting had borne its first flowering stalk within a month. How awesome! Etymology: The genus Pseuderanthemum is derived from pseudes in Greek, meaning ‘false‘, defining it as not being a true Eranthemum, which is the name of a group of very closely related plants. ‘Eranthemum‘, from erranos, meaning ‘lovely’, and anthemon, meaning ‘flower’; and reticulatum, meaning ‘net’, referring to its characteristic net-like venation on the foliage. Origin: Native to the open forests of Polynesia and Melanesia. Plant type: Ornamental tropical flowering shrub. Features: Pseuderanthemum reticulatum is an outstanding species of the genus Pseuderanthemum which consists of about 60 species of herbs and shrubs native to the tropical regions of the world. 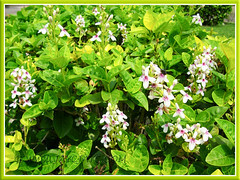 An erect, multi-branched and evergreen perennial shrub that is moderate to fast-growing and can reach 1-2 m (3.2-6.5 ft) in height. It bears simple, entire and ovate leaves, 7.6-12.7 cm (3-5 ins) long, variegated and are arranged in opposite pairs along the stems. 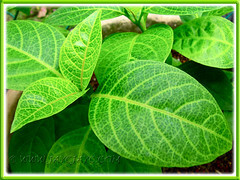 Notwithstanding its beautiful characteristic foliar variegation, the variable leaves may appear in an assortment of colours depending on the amount of sunlight it gets and the age of the leaves. Shaded leaves may be just solid green or lightly variegated while the green leaves basked in good sun will have a unique colouration, marked by bright yellow veins and patterned by a chartreuse network of sorts in-between, in marvelous contrast. Young shoots too may have the same variegation or just plain golden and creamy yellow. Simply lovely! Yellow-vein Eranthemum’s other attractive feature is that it flowers abundantly all year round in the tropics. Not only will the plant starts to flower when young but a matured bush is not affected by hard-pruning and will throw out new shoots and rebloom as quickly. 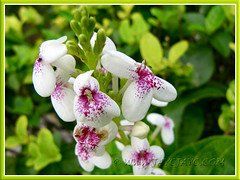 It produces small white flat-faced flowers, 5-lobed with 2 fused together, and dotted with magenta-purple spots. Flowers are held in branched cluster on an upright spike at the branch tips. Flowers will eventually develop into small, club-shaped fruiting capsules, each having 4 seeds. There’s another variegated form of this species plant, Pseuderanthemum reticulatum ‘Variegatum’ with blotches of green and white hues on its foliage. Quite an eye-catching one too! Culture (Care): Pseuderanthemum reticulatum grows easily with moderate care. 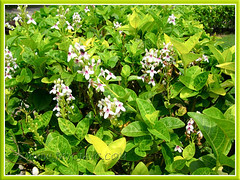 It enjoys the sunny, humid and wet seasons of the tropics. Light: Grows best in full sun or partial sun for vibrant foliage colours. Moisture: Average water requirements. 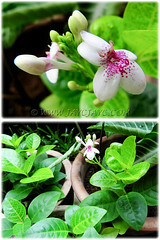 However, it thrives best with regular watering, especially during the hot and dry seasons. It enjoys high humidity. Soil: Prefers well-drained and fertile loamy soils. Others: Prune regularly to maintain preferred height and size, to encourage new growth and more blooms, as well as to keep bush dense and compact. 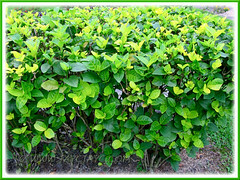 It tolerates hard-pruning very well and should be applied to keep hedges neat and tidy. Feed once monthly with a balanced fertilizer. Generally free from diseases and pests. However, do watch out for caterpillars that feed on its leaves. For subtropical and temperate regions: Hardiness: USDA Zone 10-11. In non-hardy areas, grow Golden Pseuderanthemum as potted plants in greenhouses or indoors as houseplants, providing sufficient bright light or receiving sunlight from the south, east or west. Propagation: Easily propagated from stem or tip cuttings that root easily on soil. Usage: Pseuderanthemum reticulatum is excellent as an ornamental specimen plant or flowering shrub. 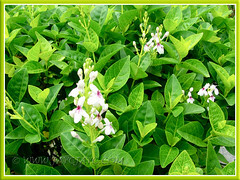 Use it in flower bed or border and ideal for container planting. Golden Eldorado makes great shrubbery when mass planted as screens or hedges because of their dense and colourful foliage and free flowering throughout the year. And grow it if you’re a nature lover to attract butterflies and bees to your garden. Thank you Gardenmatrial for info. What are the best ways to kill the tiny brown bugs infesting the Golden Eldorado plant? Probably just squash them with your hands.